For those you'd love to indulge, this satisfying gift combines the natural sweetness of fresh fruit with the delicious richness of premium chocolates.Items come packaged in a lovely keepsake tote. 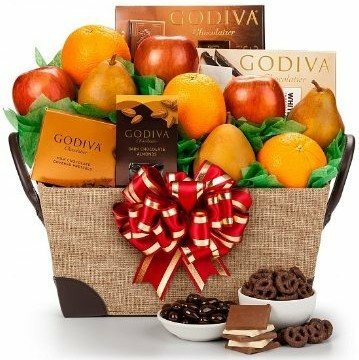 This gift Includes the following: 3 Bosc Pears, 3 California Navel Oranges, 3 NW Fuji Apples, Godiva Milk Chocolate Tablet 3.5 oz, Godiva Chocolate Covered Pretzels 2.5 oz, Godiva White Chocolate Vanilla Bean Tablet 3.5 oz, Godiva Dark Chocolate Covered Almonds 2 oz. Measures 12" x 9" x 8" and weighs approximately 8 lbs.